AWeber has added two new features that will be of interest to marketers considering the AWeber platform. One makes moving lists easier, and the other enables easier email marketing in a global world. 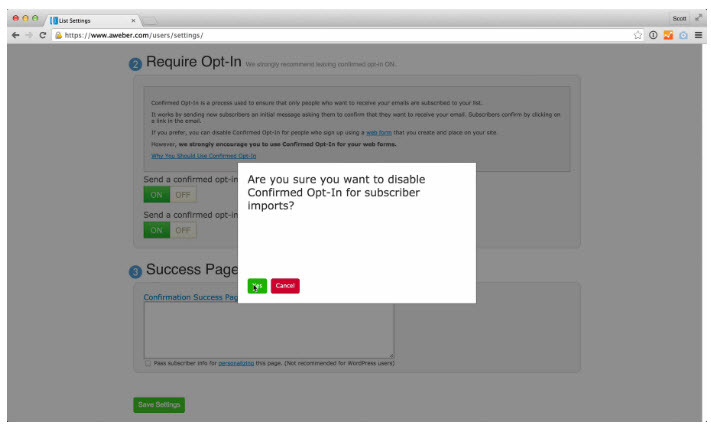 The first new feature is the ability to upload email lists without asking people to opt in again. AWeber is using Confirmed Opt In (COI). COI is an industry standard that reduces the risk of (later) spam complaints when people had to re-confirm their subscription. According to AWeber, they will still be able to ensure the same level of deliverability for users. AWeber customers can now import their email lists and subscribers into the AWeber platform, without requiring subscribers to opt-in (a second time). AWeber states that “for years, AWeber’s automated reputation system has been sifting, sorting and scoring every email being sent by every customer. It allows us to quickly identify and remove anyone who doesn’t follow email marketing best practices.” This indicates that AWeber indeed has a vetting process in place that will try and catch spammers and people with bad lists before their first send to that imported email list. The second new feature is the ability to send emails in any language using Unicode. Unicode is an international encoding standard that allows emails to be delivered to subscribers in the language of their choice. Unicode also allows for the use of emojis within emails, since emojis are also enabled by Unicode. Although the use of emojis is not for every brand, using emojis in emails can give B2C email marketing a friendly, casual feel. Although neither of these two new features are ground-breaking, they will matter to marketers looking at the AWeber platform, especially if they do not want to opt-in the list again on import. Aweber Marketing software provides an email service for small businesses, bloggers and nonprofits with its autoresponder email automation and newsletter software.